This simple chia pudding can be enjoyed for breakfast, as a snack or for dessert! Has only a handful of wholesome ingredients and is gluten, grain, dairy, and refined sugar free. This chia pudding was a quick snack that I made a couple of days ago and shared on Instagram. I honestly had no intention of posting it to the blog because it’s really one of those super simple, non-blog worthy posts. Kind of like avocado toast or chocolate milk. As I’ve already eaten this three times in the last two days, I knew I had to share because I will be making it often…talk about YUM! Chocolate chia pudding is one of my favorite “healthy” treats. I can make a big batch of it and have it ready in the fridge for snacking. Chia pudding is also great for on the go snacks for lunch boxes or picnics. These cute little Weck jars are the perfect size for individual pudding cups too! For some probiotics, I topped the pudding with some yogurt and fresh cherries. Each bite tasted like creamy chocolate cheesecake! It was so good! If cherries aren’t in season where you are, you can always use your favorite berry or even bananas…anything that pairs well with chocolate will work! Enjoy! A simple yet delicious treat that can be enjoyed for breakfast, as a snack or for dessert! Only a handful of wholesome ingredients and is gluten, grain, dairy, and refined sugar free. Blend together chia seeds, cocoa powder, and salt in a medium bowl or container. Add vanilla, sweetener, and begin to whisk in milk a little at a time until cocoa powder and chia seeds are well blended. Store in an airtight container in the fridge for 1 hour or more, or until seeds have gelled and pudding has thickened. Whisk again halfway through to break up clumps of chia seeds. Divide pudding into bowls and top with a few spoonfuls of yogurt and fresh cherries. You can slice the cherries and drizzle with a bit of honey or maple syrup if your cherries are tart. Add cherries to the top of the chia pudding and yogurt. Sprinkle with cacao nibs or sliced almonds, for crunch (optional). Makes 3–4 servings. How delicious do these look! I’m loving the one with kiwi and strawberries. Yum! Hi Kara, thank you for the kind words! 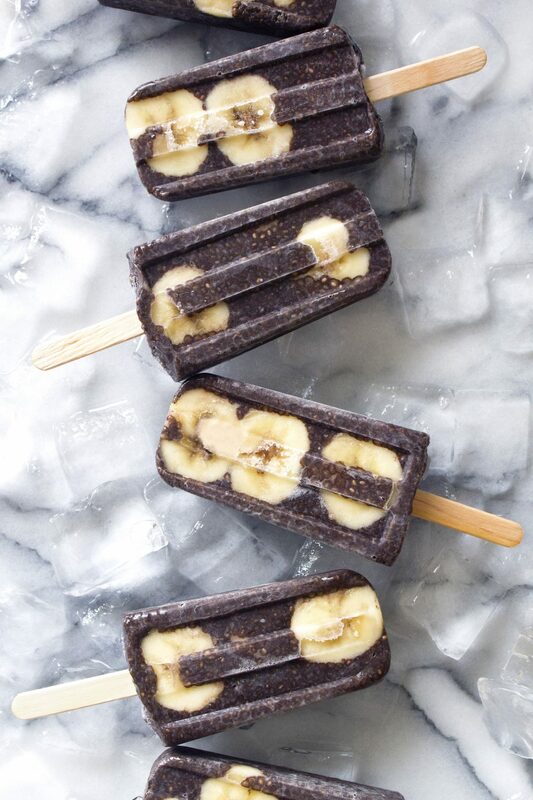 Can you believe I have never had chia seeds, I like all the options you gave above especially the banana pops. I will have to give the recipe a try. Thank you. Please let me know what you think after you try it out. This looks so yummy! 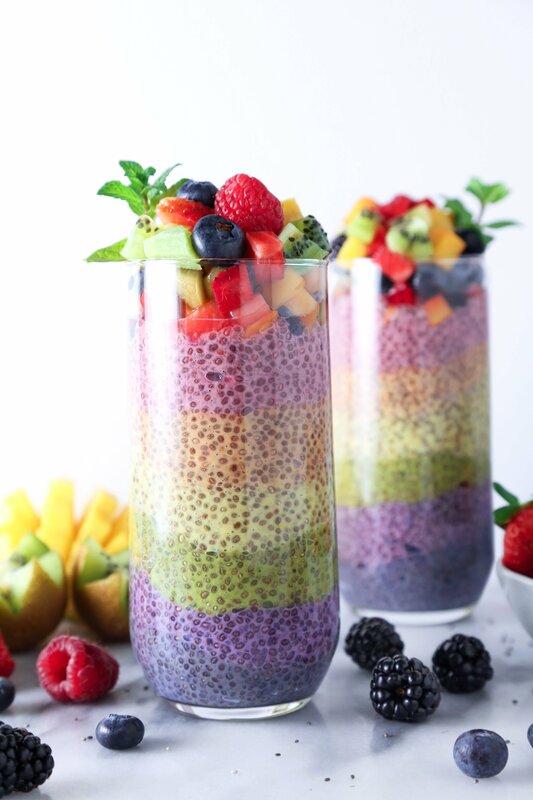 I’ve never tried chia pudding but now I really want to give it a shot! Oh my sweet jesus! This looks AMAZING!!!!! This looks sooo good and I love that it is began friendly. My family and I love yogurt, but vegan yogurt is more expensive than dairy yogurt, so we don’t eat it as often. Can’t wait wait to try this special recipe! I LOVE how simple this is. I am always a fan of being able to see something with so few ingredients yet still be so good. This looks amazing! I’ve never had chia pudding but now I really want to! You should try it Helen. It’s really tasty. Have a great weekend! I love chia pudding! This looks delicious! YUMMY! I am a huge fan of Cherries and this pudding looks delicious! 🙂 I totally want to try it! This looks amazing! 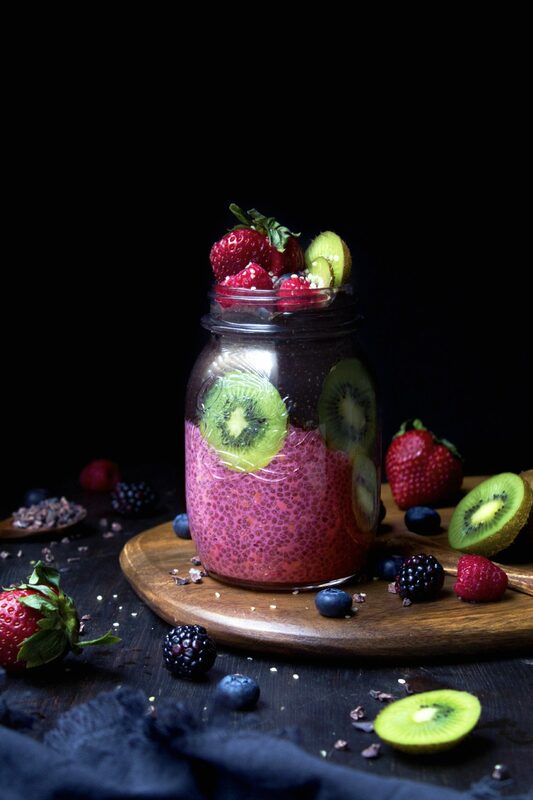 I’ve never tried chia pudding but I have to after seeing your photos! Pinned this. Yum! This is my favourite kind of recipe – one that looks naughty but is actually nice. I’ve never tried cherries with my chia puddings before – thanks for the idea! Oh my, those cherries look p-r-e-t-t-y delicious. I love chia pudding, thank you for reminding me! Heading off to the kitchen to make this for tomorrow morning!